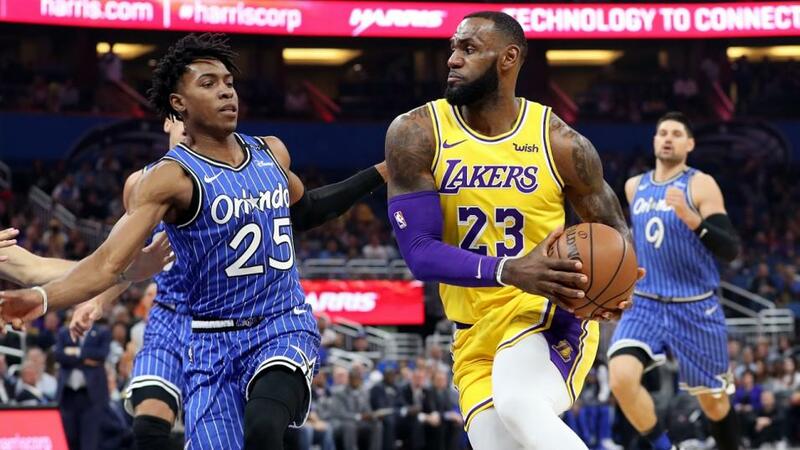 Can LeBron dazzle against the Magic? "They couldn't see off Orlando though. The Magic, led by center Nikola Vucevic 36 points, snapped four consecutive Los Angeles wins last week when the Lakers spun through Florida. LeBron was so miffed he ripped off 51 points the following night against the Heat." After a slow start as the LABron Lakers, King James' new team are 9-2 in their in their last 11. He leads the team in almost every major stat - minutes, points, assists, rebounds, even steals per game - and has really upped his game during this run. It's seen them take some significant scalps, Utah most recently and Portland when they came to the Staples Center last week, but most have been against weaker teams. But then, those are the games they'd been messing up early in the season. They couldn't see off Orlando though. The Magic, led by center Nikola Vucevic's 36 points, snapped four consecutive Los Angeles wins last week when the Lakers spun through Florida. LeBron was so miffed he ripped off 51 points the following night against the Heat. The Montenegrin 7-footer is a tough match-up for LA, who lack someone who can handle his speed and size combination, so that'll give the Magic some encouragement as 8.5 point underdogs in this. Under on the total points appeals more than a side on the line though. Both of these teams trend towards unders, with nine of the Lakers last 11 games not meeting the points expectations, while 12 of Orlando's last 17 road games have also failed to add up to over. Take the [1.98] available on the under line of 218.5 points. The Grizzlies are among the leading teams in the Western Conference after an dogged start to the season that sees them allowing the fewest points to opponents in the league. That their gritty style has lifted them this high bucks many of the recent trends. In a league obssessed with upping the pace, the Grizzlies produce some offensive numbers that'd have analytic experts' heads spinning. Luckily, they make opponents post even worse ones. Their starting five is holding teams to under 88 points per 100 possessions, and as a team they're allowing just over 100 points per game in total. Marc Gasol is still their primary offensive threat, and could be playing the best ball of his NBA career. The Grizz are +9.1 in offensive rating when he's on the court. For comparison, the Warriors are +11.4 when Steph Curry plays. The Knicks head to Memphis having won their last two, but that follows a run of one win in nine. Both victories, against Boston and New Orleans, show them improving offensively. They average under 109 points per game, but have scored at a rate of 115 in their last three. Coach David Fizdale is returning to the city he was turfed out of just a year ago, and would love to take down his old side when they're riding high. The Knicks' offensive burst makes the total points line of 207.5 look low here, despite Memphis' defensive prowess. The visitors have seen five overs in their last six games too as they're also allowing over 115 points per game. Even with they're tight defence, Memphis have seen four overs in their last six. Take the Total Points over at [1.91]. This season for the Jazz is striking an increasingly discordant note. They've taken a hammering from the schedule, playing 12 of 19 games on the road, a sequence that's featured some of the toughest away venues in the league. That goes some way to explaining their last spot in the Northwest Division on 8-11, but it doesn't excuse everything. Utah are 2-5 in Salt Lake City too, a traditional fortress. There are issues at both ends of the court, but Quin Snyder's team had built an identity based on defence, and should be up with Memphis among the tightest defences in the league. Instead, their allowing eight points more per game than last season, and it's costing them games. game where Utah were 9.5 point home favourites, show they're some way from meeting those hopes at the moment. The Kings have the second best home against-the-spread record in the league at 6-1-1, and are 5-3 straight-up on their own court. Not bad, right? Well, with Sacramento, things are never straightforward. Coach Dave Joerger is getting heat from his bosses for, err, winning too many games. It remains to be seen what comes of that situation. For now, he's in place and will continue to use veterans despite the misgivings of the front office. They're in a tough spot coming from the Warriors game last night, an agonising loss. The fatigue from that should mean the Jazz can avenge their loss to the Kings last week and cover the line at [1.91] despite their issues. They need to start winning games like these.